72 The PCB Magazine • August 2017 First priority is to reduce and elliminate through-vias. These block routing channels on the innerlayers. By eliminating 25% of the TH, 2-3X as many traces can be routed on the in- nerlayers. One way to do this is to move the ground plane (that is usually on layer 2) to the surface and use the microvias as via-in-pad (VIP) or near-via-in-pad (NVIP). This eliminates the most abundant vias on the boards- the ones to ground. As a consequence blind vias will have more conventional aspect ratios. More on this in a futue column. Drivers for HDI One needs to fully understand end user re- quirements prior to making capital investments for HDI production. It is a given that electronic systems and packages are becoming denser. All one has to do is look at the latest smart phones and tablets. However there are other drivers for this miniaturization trend that may not be ob- vious to the reader. Fine-pitch packages (QFPs and BGAs) and increasing pin counts of packag- es are driving the interconnect designs for mili- tary-aerospace, medical, telecom and industrial electronics. 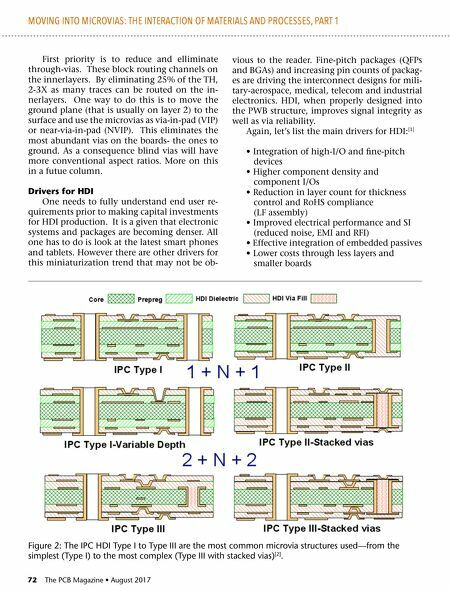 HDI, when properly designed into the PWB structure, improves signal integrity as well as via reliability. 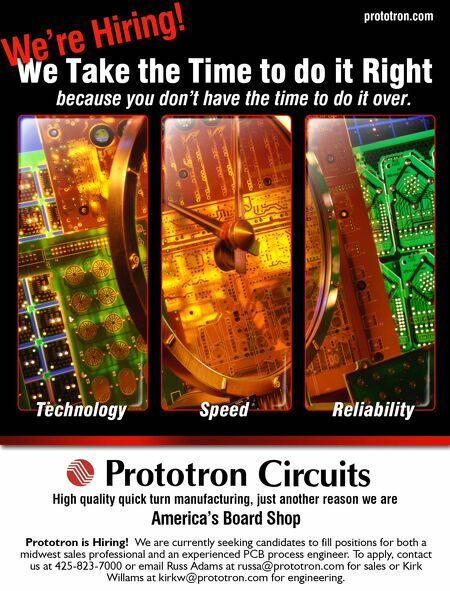 Again, let's list the main drivers for HDI:  • Integration of high-I/O and fine-pitch devices • Higher component density and component I/Os • Reduction in layer count for thickness control and RoHS compliance (LF assembly) • Improved electrical performance and SI (reduced noise, EMI and RFI) • Effective integration of embedded passives • Lower costs through less layers and smaller boards MOVING INTO MICROVIAS: THE INTERACTION OF MATERIALS AND PROCESSES, PART 1 Figure 2: The IPC HDI Type I to Type III are the most common microvia structures used—from the simplest (Type I) to the most complex (Type III with stacked vias)  .